Sunday November 18, 2012 – On Friday I had the chance to go shopping with a few other classmates. At one point we went into a department store which sold shoes, clothes, makeup and accessories, it reminded me of Winners at home in Canada. I walked passed a makeup stand that sold many common and popular makeup poducts such as L’Oreal and Lancome. I approached the stand and noticed a few different ads and one in particular that featured a picture of Aishwarya Rai. Aishwarya is a very famous Indian film actress who has won miss India and miss world titles and the media has often regarded her as the most beautiful women in the world. 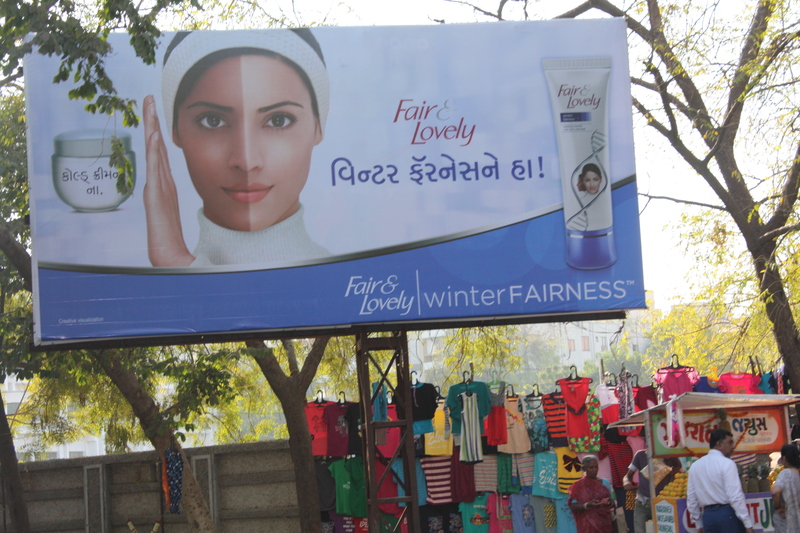 As a popular style and beauty icon for Indian women I was intrigued and amazed by the ad that was displayed at the beauty stand in this store (the cover images for this post). I tried to ask the three saleswomen what their thoughts were on the ad and on Aishwarya and her image but there was a bit of a language barrier. However, they did understand and begin to smile and get excited when I pointed to my own skin. They immediately showed me some makeup, foundation and powder that I could have easily mistaken for my own makeup products. It appeared that these very fair makeup products were top selling items for them as they were showcased on the counter as featured “tester” products. It felt like I was at home at my local mall, all the makeup shades were light and did not appear to reflect the darker tones of India skin. I was not allowed to take photos in the store so the girls kindly left me leave with a L’Oreal advertisement that they ripped out of a magazine. There seems to be this light skin obsession in the media here. Most of the billboard ads that I have collected showcase young and beautiful female models with very light and fair skin. The ideals of beauty in Indian culture seem to elude to a conclusion that the lighter you are the more beautiful you are. As many Indian women are looking up to Aishwarya as a famous public image they will be drawn to purchase light makeup and skin whitening cream to achieve this image. A shocking advertisement that many of my classmates have discussed is one billboard that features a women and half of her face is brown and the other half, the look she is trying to achieve, “the beautiful half” is white. The attempts and influence from the media to transform their skin is truly shocking. I think many of us have agreed that the local women are extremely beautiful here, their image, presence and the way they dress is very graceful and we question why they want to change their natural (dark) features. In the slideshow above I have inserted some before and after photos of Aishwarya where you can see the transformation from dark to light as she became more famous in India and the world. It is interesting to see how dark she was as a child compared to how her skin looks now. A completely different person. Monday November 19, 2012 – I thought I would expand on this post after the experience I had today. Some of us girls treated ourselves to a spa day here in Ahmedabad. 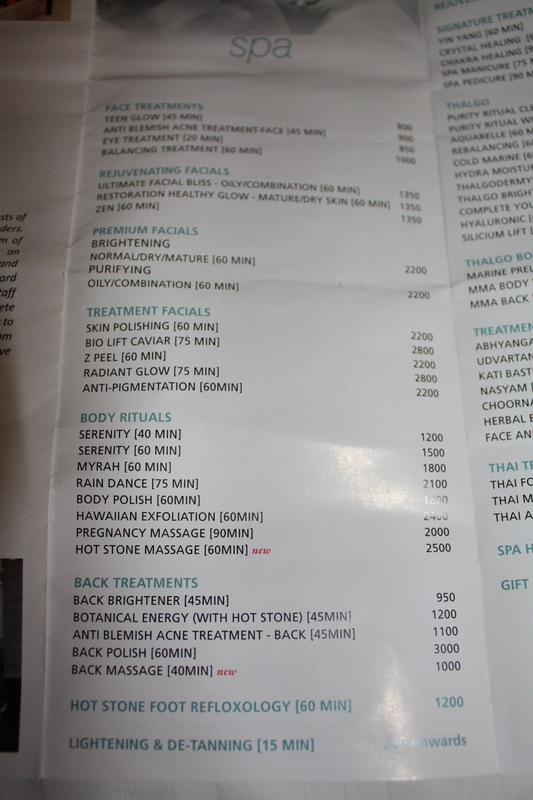 While I was in the waiting room I was reading the spa menu (see picture below) and quickly noticed the lightning and de-tanning option on the treatment menu. I am continually astounded by the extent that the women will go to to achieve the lighter image and have to remind myself that we are doing the exact same thing at home, it seems so silly that in both cultures we are fighting to alter our natural beauty and appearance. Interesting how women in the western world go to sun tanning studios, beaches and strive to have darker skin with a tan in order to look beautiful. What does this say? Yes very interesting and there is so much irony in all of this. Have a look at the last spa menu treatment option in the picture above. I noticed the smae thing in Vietnam when I was there. On the beautiful beaches the few women were covered from head to toe to protect them from the sun. There we were trying to get a tan. Everywhere there were adverts for “white” makeup. Many of the women had white faces from bleach treatments but the skin changed colour at their necks. I am a friend of your mom’s and I think this is a great study you are doing. It is amazing that many women seem to be focused on the things they don’t have. If we have curly hair, we want straight. If we are dark skinned, we want whiter. If we have blue eyes, we want brown. What makes us do that? Is it advertising? Societal pressures? And much more…. Hi Cindy, we do seem to be always striving for what we don’t have and the irony is so silly that different cultures try to achieve the opposite of their natural features, its like we’re fighting against each other to define “the ideal image.” I do think media and advertising has a lot to do with it which will therefore reenforce societal pressures and perceptions of beauty, here in India specifically it is the middle class women that will go to great lengths for whitening treatments as I’m assuming they are exposed to more media and also can afford the expense.